Diva Says What: Garden Update! Look how it's growing! Vegetable gardening rules. Real results. Real food. Is this not the most amazing thing you've ever seen? 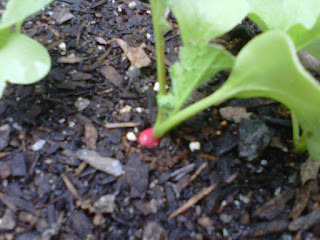 A little radish popping up! I don't like radishes, I don't know how to cook them, and I will likely never, ever use them, but Grant insisted we plant them so we did. Now I'm obsessed with the little bulb that is popping up. It's so cute. Since we don't have a dog I might make this my new pet. Oojaboo! 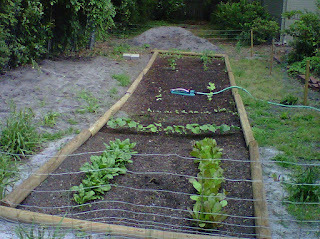 So far we've been able to eat both types of lettuce and I think the green onions aren't too far behind. Things are getting legit over here. Now I just need a bumper sticker that says "I'd Rather be Gardening" and some Crocs and I'll be official. It's all about the little things!